Yep, Toornament is free. You’ll read this sentence a few time during this blog, but want to make it super clear: Toornament is free. With our explosive growth these past few months a lot of new members, organizers and participants alike, asked the money question: do I have to pay to run a tournament? Are there features to unlock on you mobile app? How much does it cost to access the API? etc. Our take is simple: Toornament aims to be the most powerful Esport platform. Toornament aims to remain free and open. We’re on a mission to elevate the Esport tournaments quality bar for Esports communities and the best way to achieve it is to make the best product possible and open it to everyone. So yeah, you got the brief: Toornament is the powerful, open and free Esport platform. be a good bet to put them in one place. We started with Vimeo and are now switching to a dedicated Youtube channel. Big news: Our parent company Oxent has been acquired by Webedia. Toornament joins a media group active in France, Germany USA or Latin America with a strong focus on Gaming and Esports. 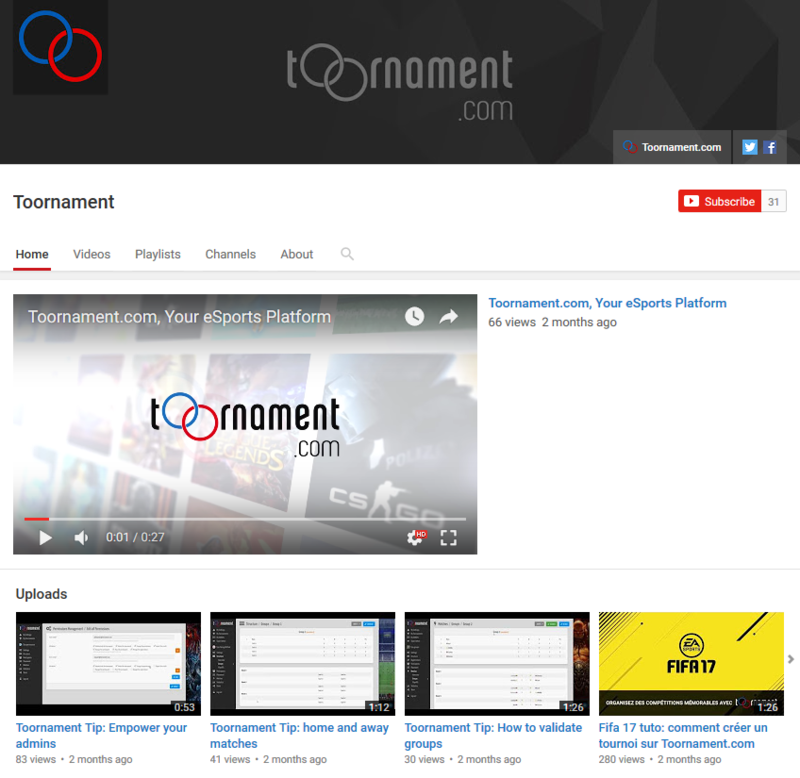 Since its official launch one year ago, Toornament has powered more than 20,000 tournaments and covered the largest Esports events around the world. Key features such as a Mobile App, open API and Participants dashboard have followed since then to cement Toornament’s leadership in Esports. 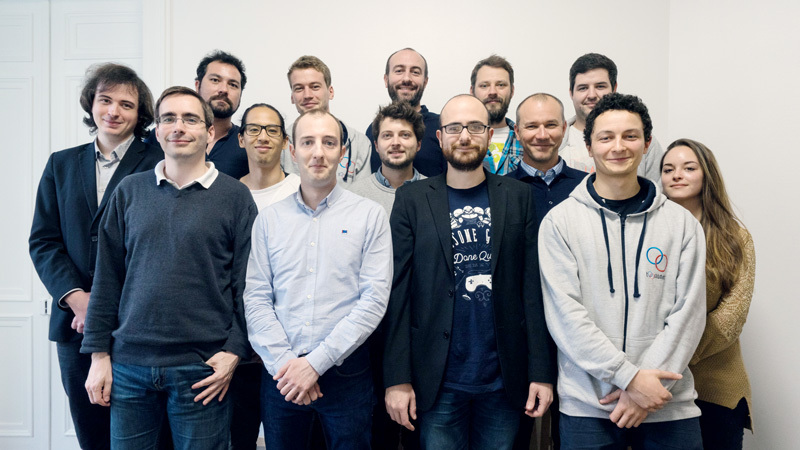 This acquisition will help Toornament accelerate its development worldwide, while acting as the backbone to Webedia’s Gaming and Esport efforts. To our present and future users, Toornament will remain free and opened to every tournament organizers and participants. [Participants] Report your match scores and results straight from our mobile app! As teased a couple of weeks ago, we’re enabling Match Report from our mobile app! 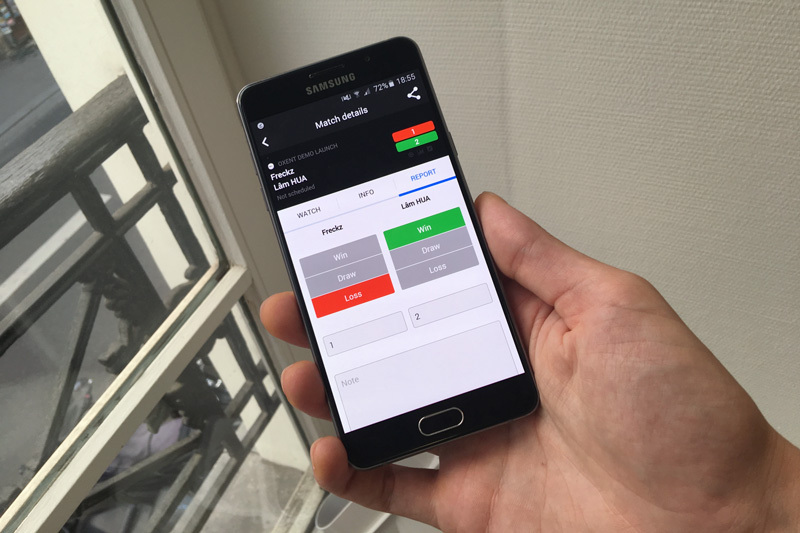 You can now check your next match and report them on the go. This new feature cements Toornament eSports as the best mobile app for tournament participants and fans. Time to update! It’s back to school for students around the world and back to code for us, with numerous enhancements tweaks on our front pages. Meet the latest ones! 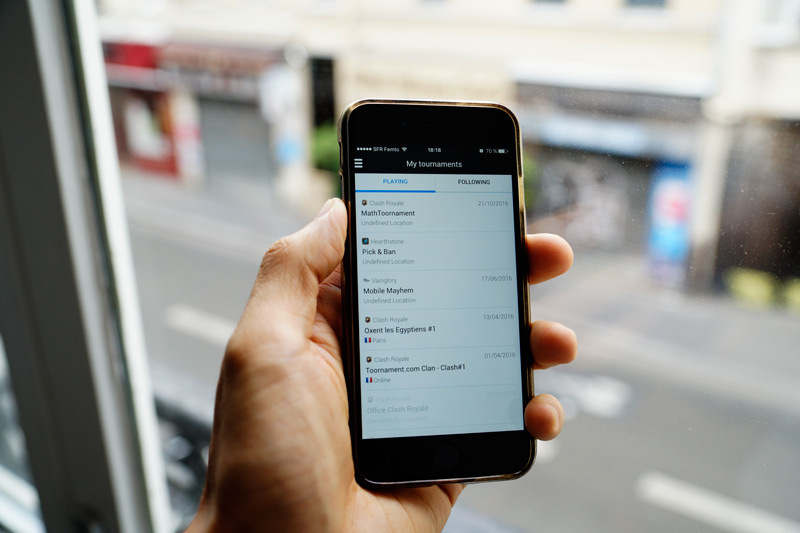 Toornament will now detect your location and adapt the dates and times to your timezone. It is already the case on our mobile app. You can still switch between your timezone, UTC and local timezone. The local timezone is the one originally attributed to the tournament by the organizer. You can now admire any bracket in its fullscreen glory, making is easier to get an overview of large brackets – or display them for your audience. 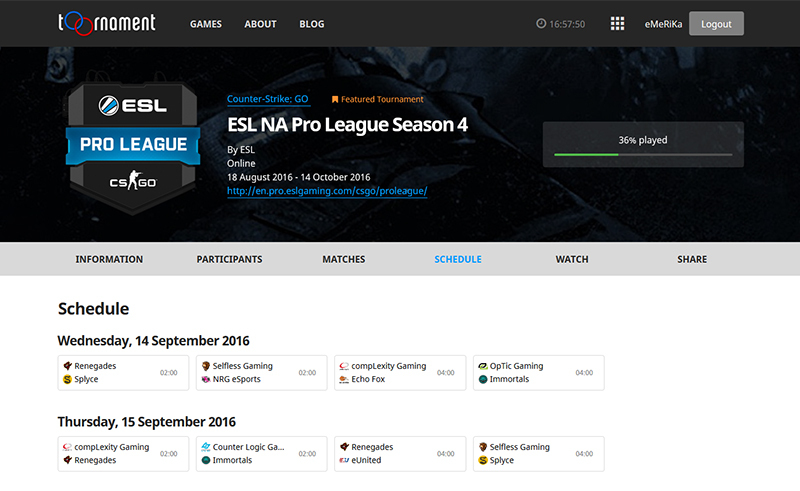 We keep on streamlining our tournament pages, as the « Matches » tab is moving today from the embedded widget to full native content. The same goes for the « Participants » tab. 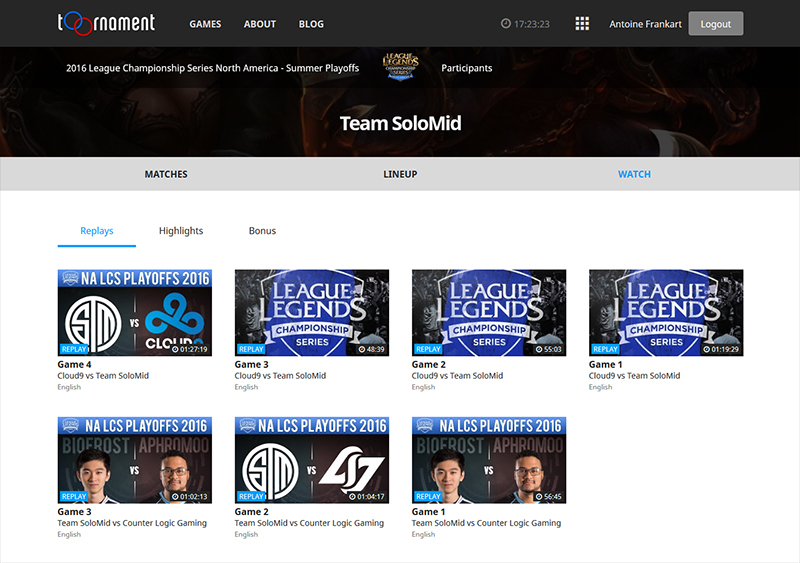 We’ve also added a dedicated “Watch” section, if you want to follow your favorite team or gamer. See you soon for more refinements! We’re happy to bring you the Pick & ban Feature for your Hearthstone tournaments! Updates to our mobile app! This feature will really enhance our app, as you’ll be able to log in your existing account or register a new one! 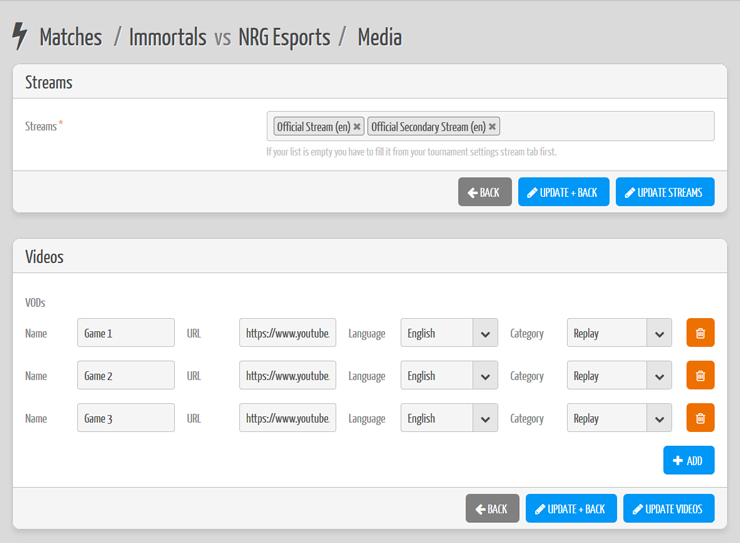 Following the Login and Register functionalities, your dashboard now includes a Participant tab named “My Tournaments”. 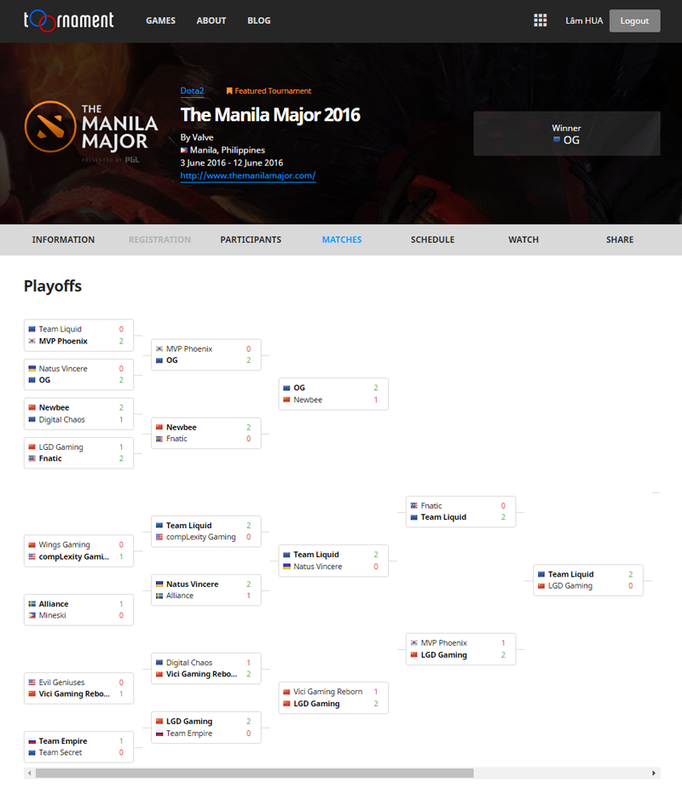 It displays all the tournaments and matches you’re participating in. Very handy to know where and when to play! While including “My Tournaments”, we’ve also updated our menu (and squashed some bugs). Your queries history has been added in our Search tool. Enjoy! 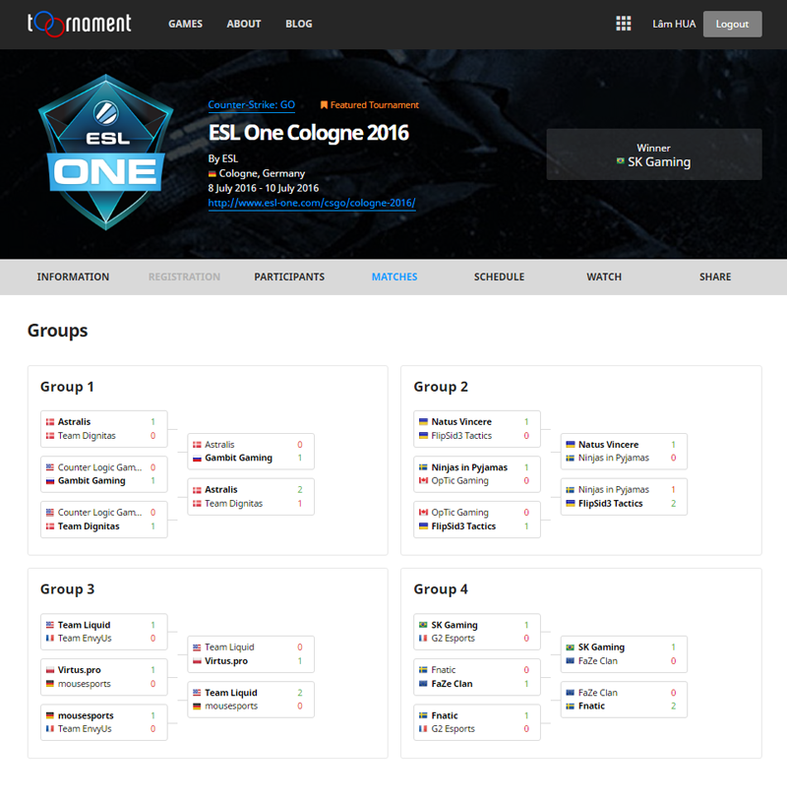 Our Tournament Public Page overhaul continues: we’re gradually swapping widget-based pages with native content. Today, we hit a new milestone with the brand new structures pages! 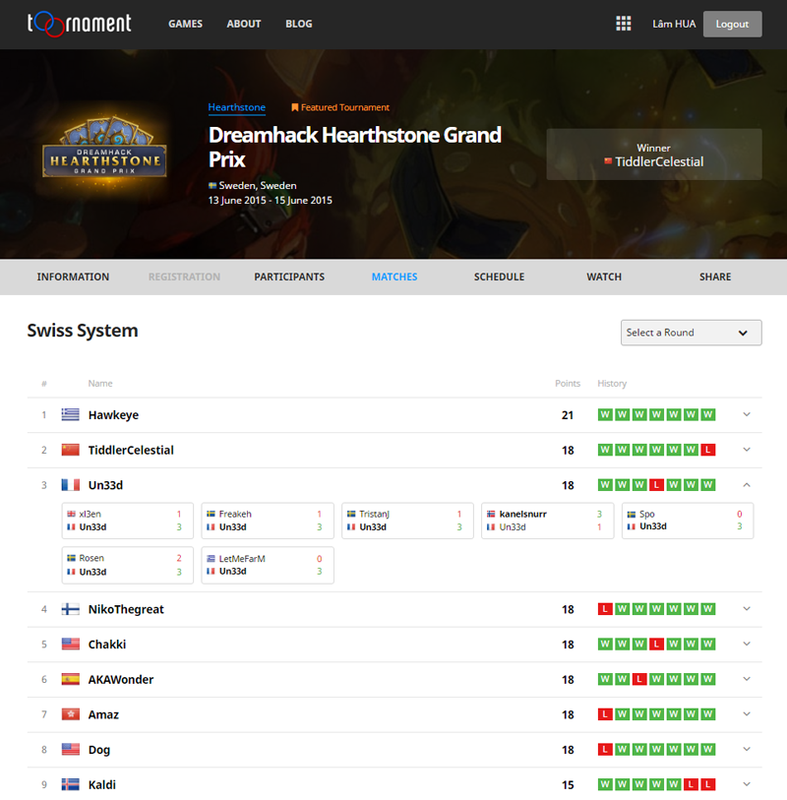 Brackets get way more estate for better viewing and we added little tweaks like detailed match history and better navigation for Groups and Swiss System. 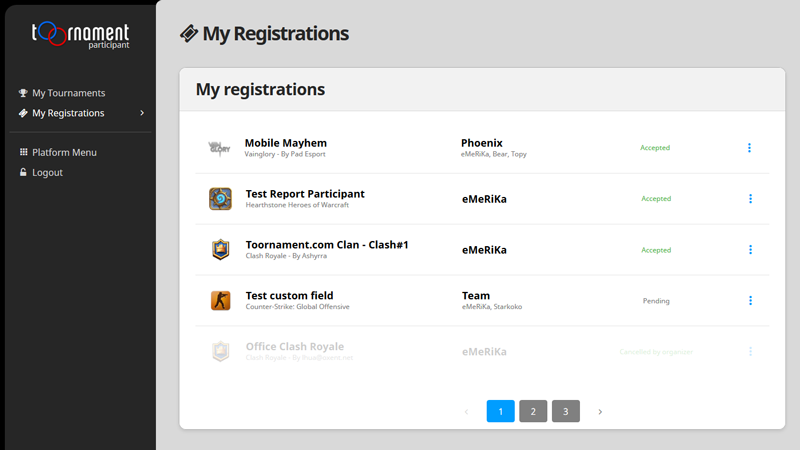 Your Participant Dashboard is growing everyday and now includes a new section: My Registrations. 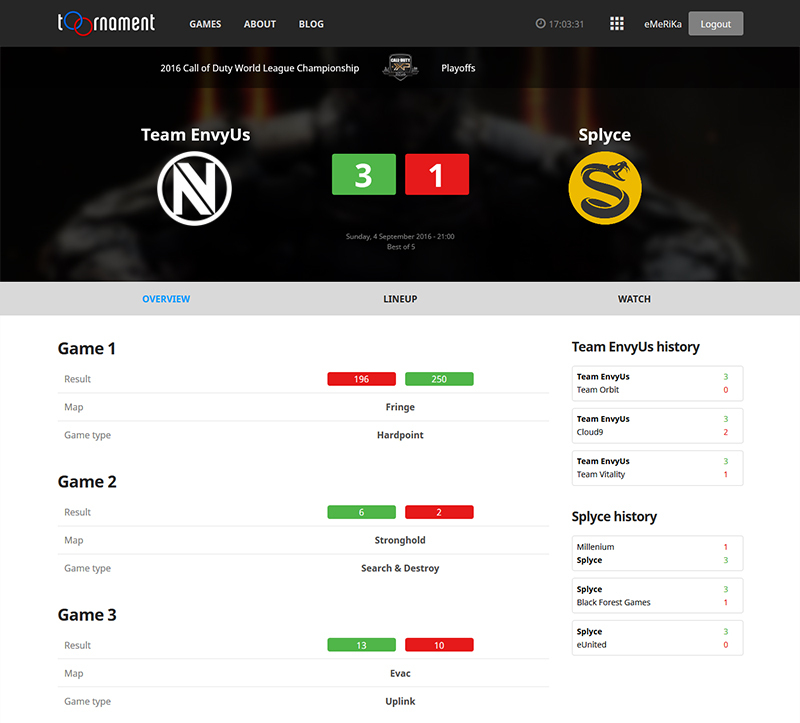 You can now easily keep an eye on all your tournaments! Instead of tabs, you now get a “Stream and Video” button in the upper right corner. As the video nature and source are getting richer, you can now tag them with “Replay”, “Highlight” or “Bonus”. 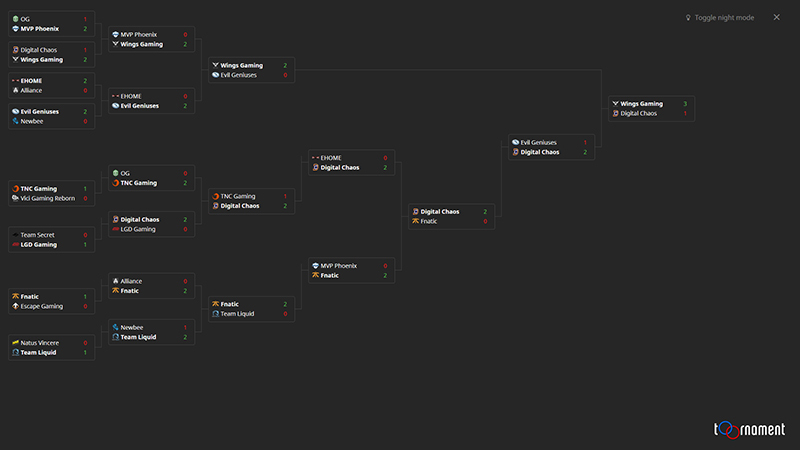 The tournament stream page is now called “Watch” and videos are displayed without using our widget. Feel free to jump into your dashboard and enjoy our new media management options!